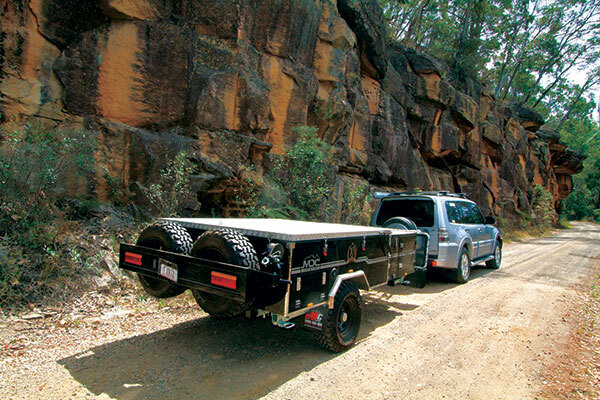 Two years ago MDC hit upon a recipe for success with their Venturer rear fold camper. 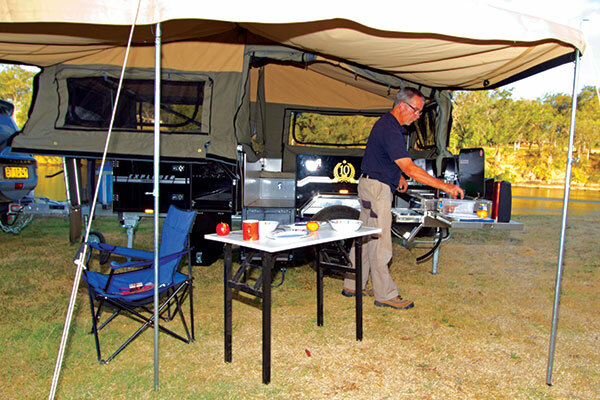 It won Camper Trailer of the Year’s budget category in 2016 and backed it up the following year with even more features to win again. The result, not surprisingly, was great sales success. The formula revolved around a basic good design jammed with great features and all at a surprisingly good price considering what you get. How could you go wrong? Now, to celebrate the company’s 10th anniversary, they have attempted to follow the same road to success with the new Explorer forward fold camper that, at just $14,990 plus on-road costs, offers an awful lot for a very good price. The Explorer follows the basic format of the currently popular forward fold layout and is clearly aimed at those with a more limited budget. The options are kept to a minimum – you can have any colour you like as long as it’s black – but the basic inclusions ensure you don’t miss out on too much. However, this is a camper that would benefit from a little fine tuning. 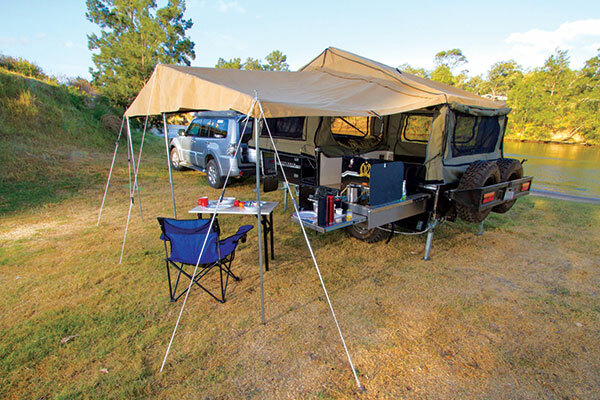 The camper is built around a hot dip galvanised 70x50x3mm chassis with a sturdy 100x50x3mm drawbar that is long enough to give you plenty of easy manoeuvrability in forward or reverse. Those with barn-door type tow vehicles (Prado, Pajero, etc.) will find rear vehicle access a problem as the brake handle limits opening. 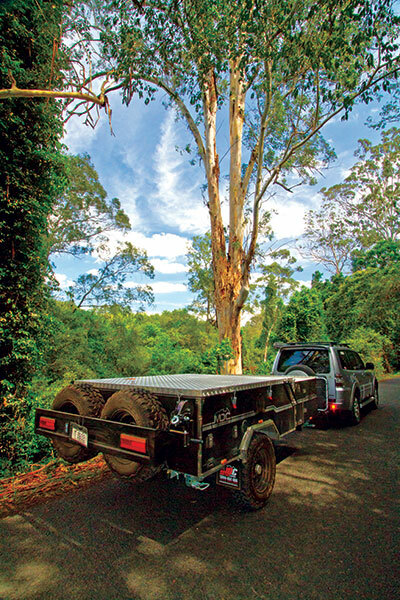 This all rides on dual shock independent suspension with 12in electric drum brakes and six-stud 15in steel rims with mud terrain tyres – on a $15k camper – wow! 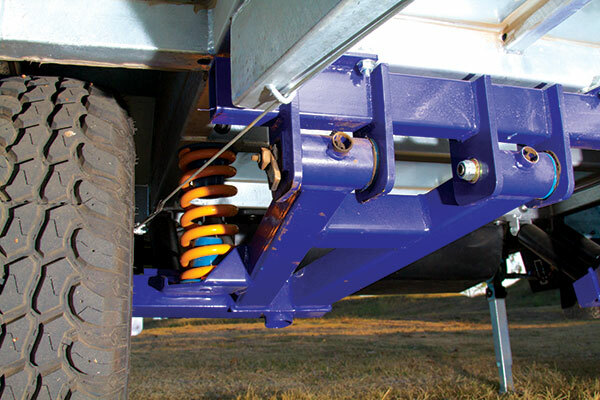 At the front is a laced stone guard, behind a poly block hitch, with mud flaps to help restrict stone damage on dirt tracks. Behind the stone guard are two jerry can holders and a ring to suit a single 9kg gas bottle. The body is Zincanneal in construction, with checkerplate aluminium at the front and over the top and stainless steel trim over the wheel arches and along the bottom and rear corners of the main body. It looks smart and well presented. 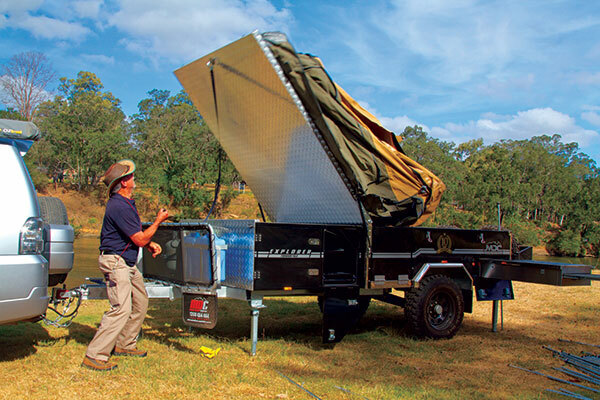 The body format is the standard for forward fold designs, with a large front box to house the fridge, poles and other items, and over which the forward folding bed rotates off the top of the rear living section. This is one of those areas where we struck our first issue. 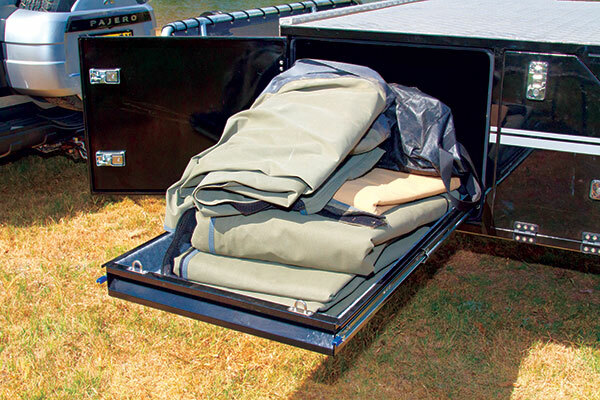 To open the camper requires undoing six over-centre latches. The bed base/top section is surprisingly heavy and can’t reasonably be lifted over by hand; you must use the winches at the front and rear. However, these pull horizontally, so you’ll need someone to lift the lid up to about a five to 10 degree angle first. Given the top is quite heavy and there are no handles or grips this is awkward, especially as the lift required we measured at 22kg. The effort required on the winch is substantial and would be beyond some people until the lid is up a bit, after which it winds up easily enough. It’s when it gets to the vertical that the biggest surprise is evident as it comes crashing over at an alarming speed. Everyone would have to be kept well clear of this to avoid injury. How this might impact the long term life of the camper is uncertain. All of this would be fixed by stronger gas struts to assist in the lifting and take the weight as the lid comes down, and possibly a lighter weight lid. Closing the body is a reverse of the process – and the problems - except that the lid does not crash back against the body as the canvas buffers the landing. 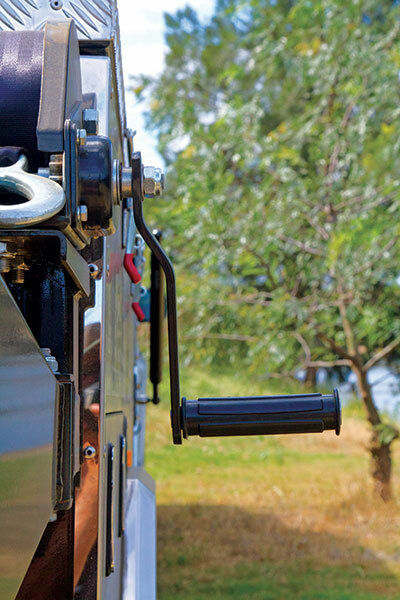 However, the rear winch is a concern in that it is displaced to the driver’s side and the handle projects well clear of the side of the camper, threatening to catch trees, scrub or unwary people. A folding handle or relocation of the winch would cure this. 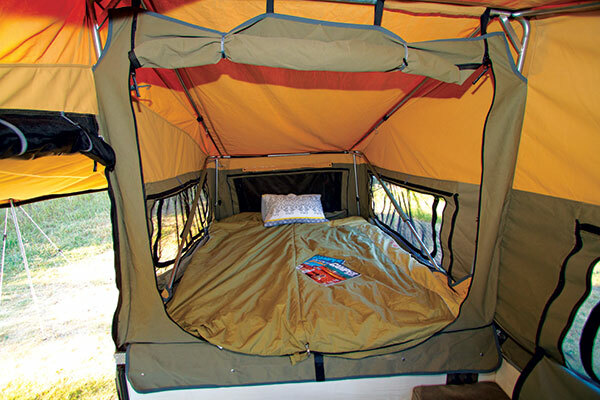 When setting up internally, the Explorer requires the insertion of four spreader bars and two front uprights, and the adjustment of the main tent centre hoop, two radial spreaders and front and rear tent hoops. These latter two could easily be fixed in size as they fold into the camper’s internal space at pack-up and this would simplify set-up by removing four adjustment points. If there is any universal complaint about Chinese-made campers it is that they have too many poles, spreaders and tent adjustment points, making for complex set-ups. All that aside, the tent and 16oz plain weave canvas appeared well made, with double seam stitching and reinforcing around the top for added waterproofing. There were six windows, all with internal and external blinds and zip-out midge mesh, as well as external canvas awnings, though the need to carry two steel poles for each seems a weight and space penalty that exceeds the benefits. The awning can remain attached when packing up – a great benefit – though it was awkward to get over the top and required a lot of poking to get it all in under the lid. It had three poles and several spreaders and is definitely a two-person job to erect. 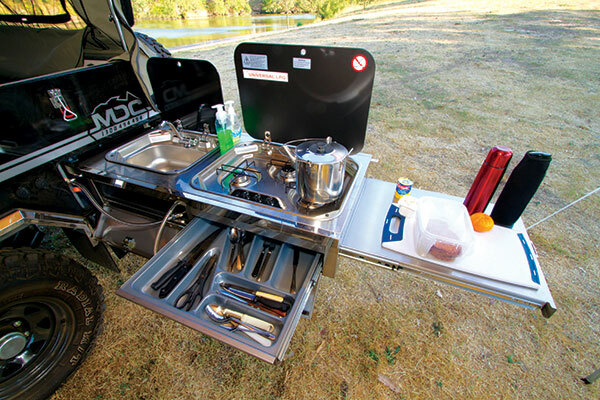 The camper comes with an excellent slide out stainless steel kitchen, with a Smev three-burner cooktop, sink and electric water pump – which occupies most of the kitchen’s 1080x540mm surface – and a 420x540mm pull-out extension. Underneath is a wide fold-down door behind which is storage for the water and gas connections and a cutlery drawer, and adjacent to the kitchen are two 12V plugs. The water travels in an 80L heavy duty poly water tank. Some of the hosing servicing is held by plastic cable ties which wouldn’t last long on stony tracks. The fridge box at the front comes with a sturdy carpeted slide with excellent tie-down points and an adjacent 12V plug and a 490mm highx580mm widex950mm long space which will cater for between a 40L and 60L fridge, depending on brand. Behind the fridge is the camper-wide pole storage tray with a storage space below with a slide that would be suitable for tubs for pantry style storage. On the driver’s side at the rear, opposite the kitchen, is the electrical power centre, with a 15A Projecta seven-stage mains charger, fuses and switches. This supports a single 100Ah AGM battery. Further along the driver’s side is a door to a locker with a carpeted storage area at the bottom and the continuation of the pole storage above and another storage area opposite the fridge with a carpeted slide. The Explorer comes with two spares – possibly a bit excessive – behind a rear panel, which would at least be contributing to the hefty ball weight of 160kg. The interior is accessed through a fold-down side door with two steps internally. The floor is vinyl, with the standard format of perimeter seating at the sides and back. Beneath the side seats is storage, though it is fairly limited due to the camper’s lower side height of 630mm and the intrusion of the wheel arches into this space. There is a lockable steel drawer immediately opposite the entry point. The rear seating is bridged by a fold-up table and an additional panel which, with removable cushions on top makes for a double bed for the kids, though as the interior space is 1700mm wide it would be cramped for many adults. The table is a sturdy design that can be removed for use outside as well as inside in inclement weather. When it comes to sleeping, the bed is a queen-sized foam with restraints to hold bedding in place when folded over. There is no fixed internal light, but this could be easily added. Internally there were pockets for small items on either side of the main bed, a modesty screen across the end of the main bed and four 12V plugs at the foot of the bed. The side of the tent above the kitchen could be rolled up for that outdoor experience even when you were seated inside and there was a full door insect screen at the entrance. 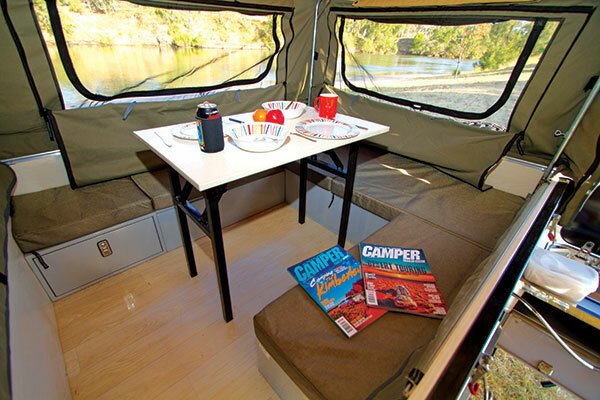 The camper comes with a full wall set, draught skirt and vinyl floor, though all of this takes up a lot of the limited storage capacity of the camper. Underneath the surface of the Explorer as we saw it there is a very good camper waiting to be unearthed. Correcting the few shortcomings should be easy and will likely be resolved by customer feedback and simple choices of alternative fittings. Even so, for under $15,000 it’s very good value. I can recall 15 years ago seeing well known brand name campers for that price which came with slipper springs and similar levels of fit-out, so the Explorer is up there on value for money. Would we recommend it? Fix the couple of issues and yes we would.